A prolific flowering pansy with a long flowering periodPansies are part of the Viola family. 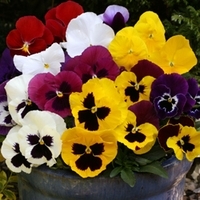 This beautiful Pansy Galore comes in a mix of bright colours with dark centres. These Pansies are prolific flowering bedding plants providing a fantastically long flowering period. Pansy Galore will bring so much delight through the cold and bleak winter months. See photos of plants from the <a href="/genus/Viola">Viola</a> genus in real gardens.